A week after rolling out local updates, Foursquare on Wednesday announced “promoted updates” as part of its broader push to monetize the social location service. Like local updates, the new ad offering allows businesses to notify customers about things like specials, new products or other news. But unlike them, promoted updates will be paid ads appearing at the top of the Explore tab, where users find personalized recommendations based on their check-in history and the activity of friends on Foursquare. That makes it the company’s first paid ad format. To separate them from other content, promoted updates (including promoted specials) are labeled as “promoted” and will only be shown to users close enough to stop by a restaurant, store or other venue. As the name suggests, promoted updates are similar to Promoted Tweets on Twitter, as well as Facebook’s Sponsored Story ads. The idea is to make ads blend as much as possible with the stream of organic recommendations or other unpaid updates that users see. Promoted updates, for instance, use the same algorithm that powers tailored recommendations based on location, time of day, past behavior and other factors. For local updates, which appear in the Foursquare app’s Friends tab, a user would have had to have “liked” or checked in several times to a particular business first. “For the first time, we’re offering a select group of pilot partners the ability to promote their locations on foursquare, through promoted updates, specials and credit card specials,” said Foursquare CRO Steven Rosenblatt. Among those initial partners are various brands, including The Gap, H&M, Hilton Hotels, Butter Lane, Batali Group and JCPenney. 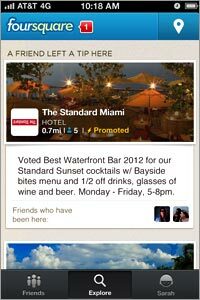 Foursquare plans to extend promoted updates to the more than 1 million merchants it works with in the coming months. The rollout of paid advertising comes almost two months after Foursquare launched a revamped version of its app that makes it a more direct competitor with recommendation services like Yelp, instead of merely a check-in service. Data released by the Pew Research Center in May showed that almost three-quarters (74%) of smartphone owners used their devices to get directions and other location-related information as of February -- up from 55% a year ago. Despite an active user base of 20 million, Foursquare faces competition not just from Yelp, but from others entering the mobile location or offers space including Zagat, Groupon and Square.